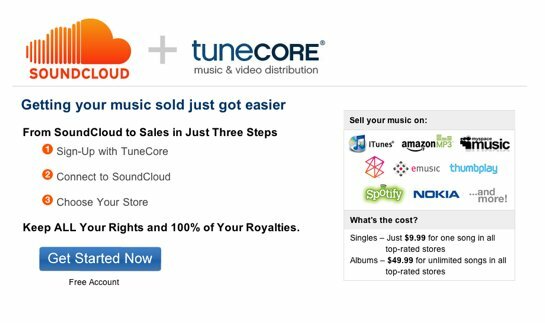 Whether or not the ability to use TuneCore as a way to get an iTunes Ping page piqued your interest, if you’re generally interested in selling your music online, here’s some more interesting news. SoundCloud has teamed up with TuneCore to allow you to sell singles and albums in a variety of online stores, including Nokia phones, Amazon MP3, Zune, Emusic, and of course iTunes. TuneCore’s approach is pretty simple: accounts are free, and you play a flat fee ($9.99 per single, $49.99 per album) to distribute music online in all the stores. You keep all of the royalties; once TuneCore gets their flat fee, they’re out of the picture fee-wise. Another interesting angle to me of all of this is what it may mean for Creative Commons-licensed music. There’s nothing stopping you from self-releasing an entire album under a permissive CC license, sharing it with communities of samplers and remixers on Creative Commons, but also generating revenue by selling it online. The SoundCloud angle here isn’t complicated; it’s just some nice integration of the two accounts to save you some time. Given the rabid following SoundCloud has started to generate, though, that’s significant. “Fatigue” is really the largest problem facing social music, as a huge array of competitors try to get the attention of artists – most of them, quite frankly, fairly useless. TuneCore is very much in the non-useless category from where I sit, and getting them and SoundCloud in front of artists could be really valuable (indeed, maybe far more valuable than iTunes Ping). 26 Free Songs. 26 TuneCore Artists. Updated – I should note, I do hope this is the first step. The killer feature here would be “buy” links right on SoundCloud, but that doesn’t appear to be implemented yet. Edit: David from SoundCloud observes in comments that you can manually insert buy links, which gives you the freedom to choose whatever store you like. Whether automating that makes sense is another question, but you definitely have options. Anyway, enough shilling for TuneCore – let’s hear what you think. Are you currently using TuneCore, or an alternative outlet? What’s your experience been? Or are you leaving this to your label?